My friends and I cycle for exercise, and for social interaction. Some of that social interaction takes place while we are on our bikes. At least it does when we are riding at a moderate enough pace where talking whilst pedalling is physically possible. Regular readers will know that most of that social interaction occurs over food. Be it pre-ride, mid-ride, post-ride, or any combination of the three. What the group wants to eat is often what determines where we ride. 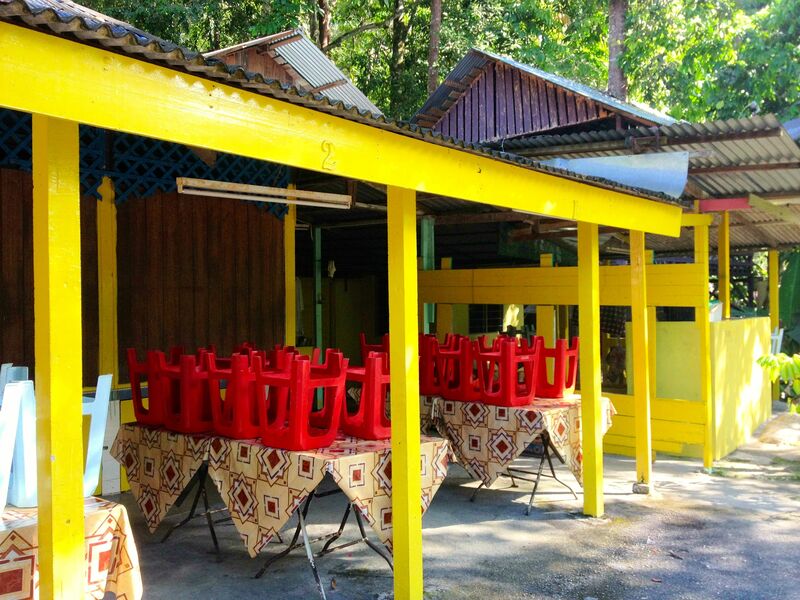 For example, a hankering for roti canai will take us to Kundang. Once in a while, the number of calories burnt during the ride is used as justification for a second roti canai, or whatever else has tickled the taste buds at the time. Whatever calorie burn the Garmin bike computer reported must surely exceed the calories in two roti canai! Unfortunately, bike computers don’t do a good job of estimating the number of calorie burnt. These devices use proprietary algorithms to calculate calorie burn. You are going to get different results from different devices, depending on the algorithms and the technology they use. There is no single international standard on how calorie burn should be measured. Another contributor to inaccuracy is what I will call user “error”. The algorithms all use data like rider height, weight, gender, fitness class, etc. to estimate calorie burn. If a rider misstates their weight, for example, the estimated calorie burn will be less accurate. The figures in the chart below are based on a 68kg / 150lb rider (so obviously not me) in constant motion; not including coasting, drafting, and descending. Lastly, accuracy is much improved with heart rate information. So if you ride without a heart rate monitor, your Garmin will present you with nothing more than a rudimentary guesstimate of your calorie burn. And more than likely overstating the number of calories you burnt. Riding with a heart monitor reporting spurious data will also skew your calorie burn number. DC Rainmaker has an informative blog post on this subject that you can read at How Calorie Measurement Works on Garmin Fitness Devices. Even if we did have accurate calorie burn information, we would not necessarily be able to match our caloric intake to our caloric output. Most of us have no idea of how many calories are in a plain roti canai (approx. 300), or a serving of nasi lemak (approx. 400), or in a Big Mac (approx 560), or in a bowl of cendol approx. 200). Those figures come from MyFitnessPal, and are approximations. Add egg to that roti canai, or a piece of fried chicken to that nasi lemak, and the calorie count will go up. Now I know that two plain roti canai and two bowls of cendol contain at least 1,000 calories. Given my weight, height, and age, I have to ride at 26 to 32kph / 16 to 20mph for between an hour and 70 minutes to burn 1,000 calories. It is a good thing that my social interactions while cycling are usually spread over three hours or so of pedalling at a decent pace. So I do earn that second roti canai after all. Plain of course! Posted in Cycling in Malaysia and tagged Calories, Cendol, Garmin, Heart Monitor, Nasi Lemak, Roti canai. Bookmark the permalink. Chris and I rode to Kampung Sri Kundang and back this morning. We got on the road at 6.50am. Just as it was getting light. We made our usual stop for roti canai and teh tarik halia. We have recently added soft-boiled kampung eggs to the breakfast list. Fresh from the backyard chicken coop. I will take a photograph of the bright orange yolks next time. We were hungry. Everything smelled so good. It all tasted so good. By the time I thought to take a photograph – this was the scene. The sun was out on our ride back to the 7-Eleven at Bukit Jelutong. We got there before 10am so the thermostat was not yet on maximum. We were sweating anyway. A delivery truck pulled up. 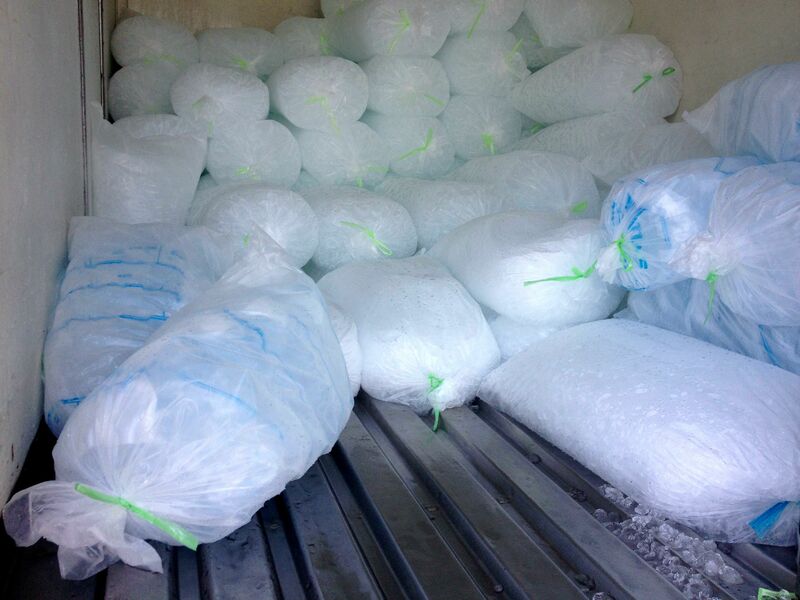 We stood so close to the open doors we were almost inside the truck. It was exactly what we needed. 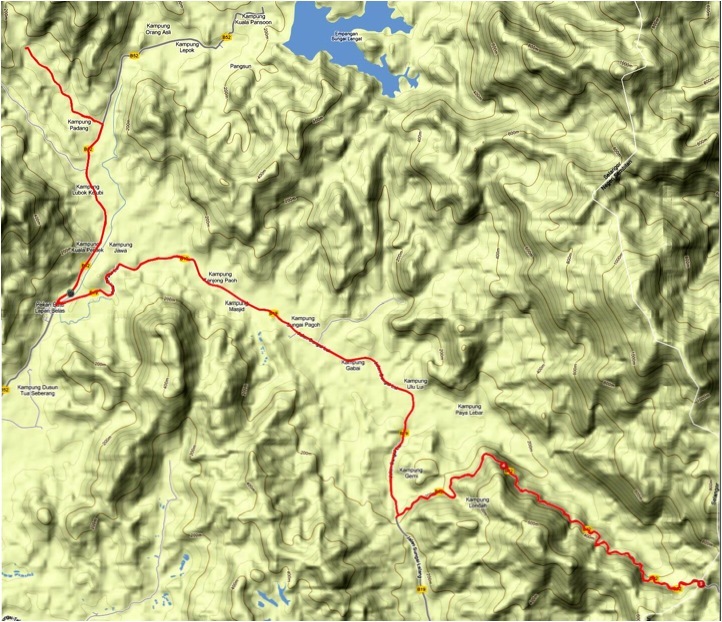 Posted in Cycling in Malaysia and tagged Kampung Sri Kundang, Roti canai, Teh tarik halia, Telur kampung. Bookmark the permalink. My Not Possibles friends in Den Haag rode the Joop Zoetemelk Classic yesterday. By all accounts it was cold and windy, with a high of 8°C / 46°F. My West End friends in Houston are just about to start the Tour de Houston. It is a balmy 17°C / 62°F in downtown Houston now. 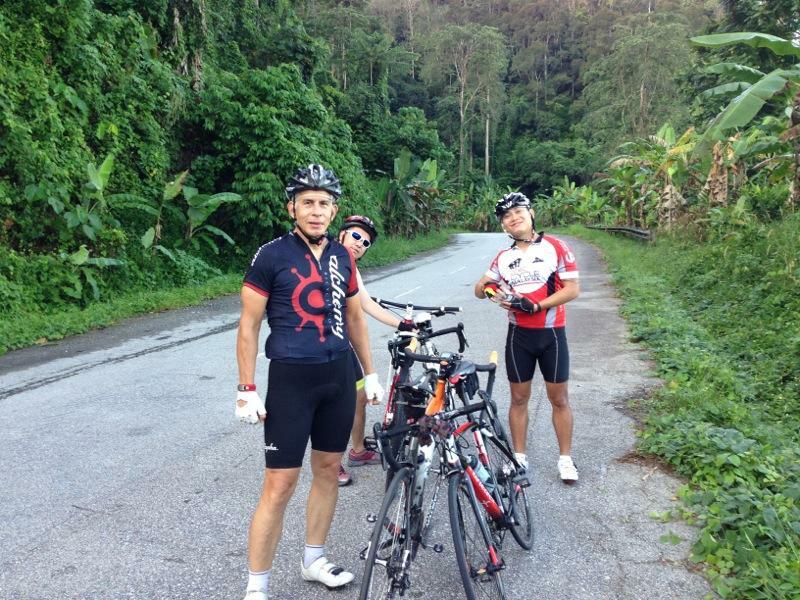 It was 34°C / 93°F by the time Chon, Mark, Marvin and I finished our ride in Hulu Langat today. Houston wins the best biking weather award for this weekend. 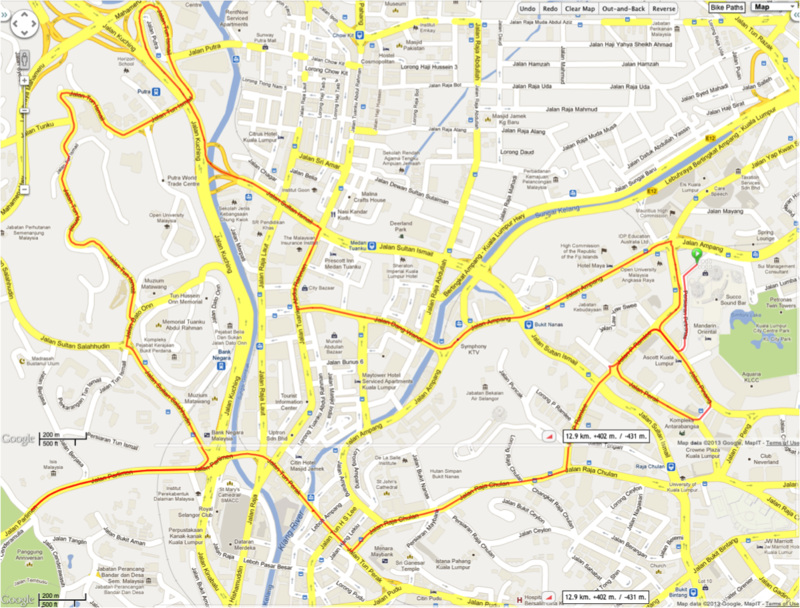 We rode from Kampung Batu 18 along Jalan Sungai Lui to the T-junction with the B32 and the B19. 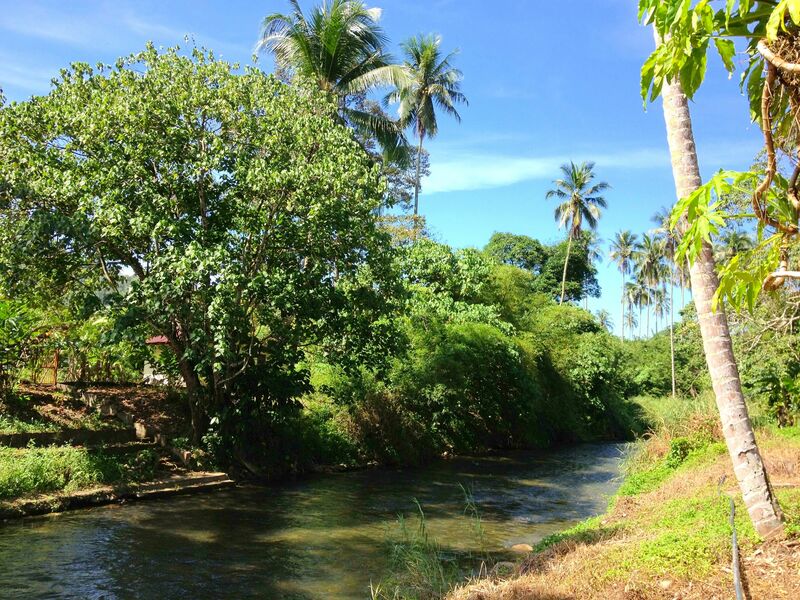 Logically enough Jalan Sungai Lui follows the Lui River along the valley floor. At the junction the only option is to turn left onto the B32 road. The B19 is still closed 5km from the T-junction because of the landslide that dropped a section of tarmac into the reservoir. The B32 takes you to the border between the states of Selangor and Negeri Sembilan. The border is at the top of a 10km climb that rises from 170 meters / 560 feet above sea level to 500 meters / 1,640 feet above sea level. It was very misty at the start, which meant great views once we got about a third of the way up the climb. Genting Peres isn’t the steepest climb in the area. Nevertheless we appreciated the stop to take photographs. It was still hard work, especially after we broke through the mist into bright sunshine. I am sure I leaked the equivalent of a Camelbak Podium Chill bottle by the time I got to the summit. Mark and Chon are waiting for Marvin, who got extra credit for doing the ride on a 29er mountain bike with knobbly tires. 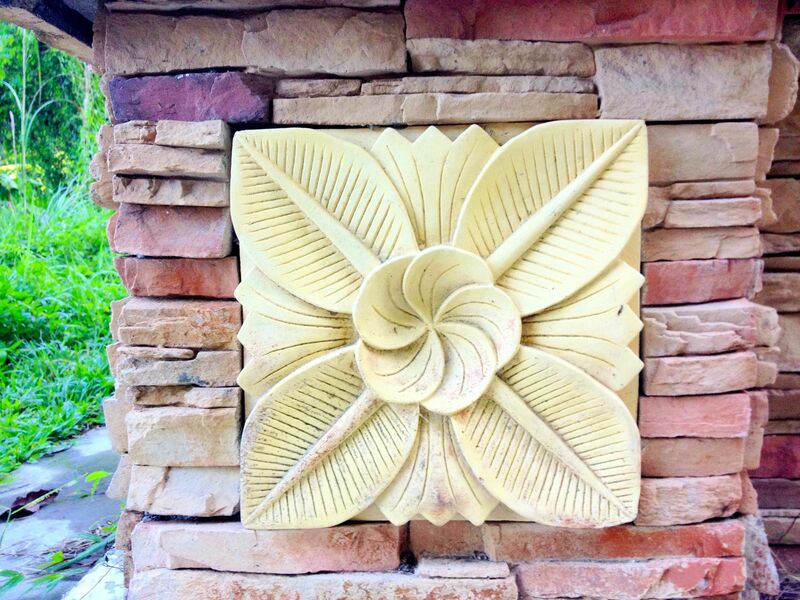 I explored a bit, and found these decorative blocks at the base of the “Terima Kasih. Sila Datang Lagi / Thank You. Please Come Again” sign behind the guys. Not bad for a sign that most people whizz past in cars. 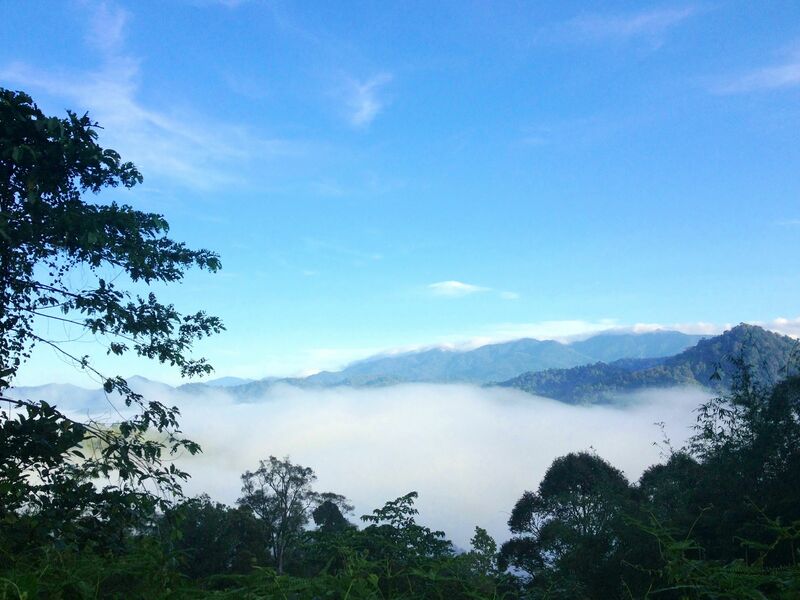 The plan was to go back the way we came to Kampung Batu 18, and then ride on to Sungai Chongkak Recreational Forest for a nasi lemak and teh tarik breakfast. It was a hot and humid second half of the ride. The thought of packets of tasty nasi lemak sustained us through the 6km climb to the restaurant. Our disappointment was palpable. Our mood was not improved by the very mediocre roti canai we ended up with at Kampung Batu 18. There was one saving grace for all of us. The thick undergrowth between where we always park and the river has recently been cleared. So we could get to some cool water to wash the sweat off our faces and arms. There was another plus for me. ISKY 2 has stopped ticking. Posted in Cycling in Malaysia, Cycling in Texas, Cycling in the Netherlands and tagged Genting Peres, Hot, Joop Zoetemelk Classic, Kampung Batu 18, Nasi Lemak, Roti canai, Sungai Chongkak, Teh Tarik, Tour de Houston. Bookmark the permalink. Nineteen of us set off from outside the 7-11 at Bukit Jelutong on the Van’s Urban Bicycle Co. group ride this morning. We were a roughly 50-50 mix of folding bikes and road bikes. Our route to Kampung Sri Kundang was a bit different this time. Instead of heading north on the Guthrie Corridor Expressway we took the hillier option along Jalan Batu Arang to the west. 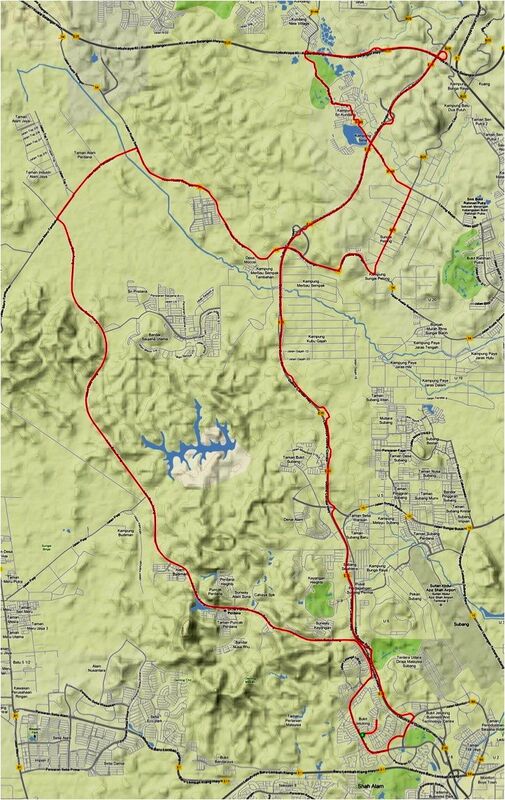 Hillier to the tune of 200 meters / 650 feet of elevation in the first seventeen kilometers. We made regular stops to regroup and to ensure that no one got lost. This was our first break at the bus stop outside the UITM Puncak Perdana campus. Photo courtesy of Van’s Urban Bicycle Co.
From here it was five more climbs before the right-hand turn toward Sungai Buloh and Kuala Selangor. 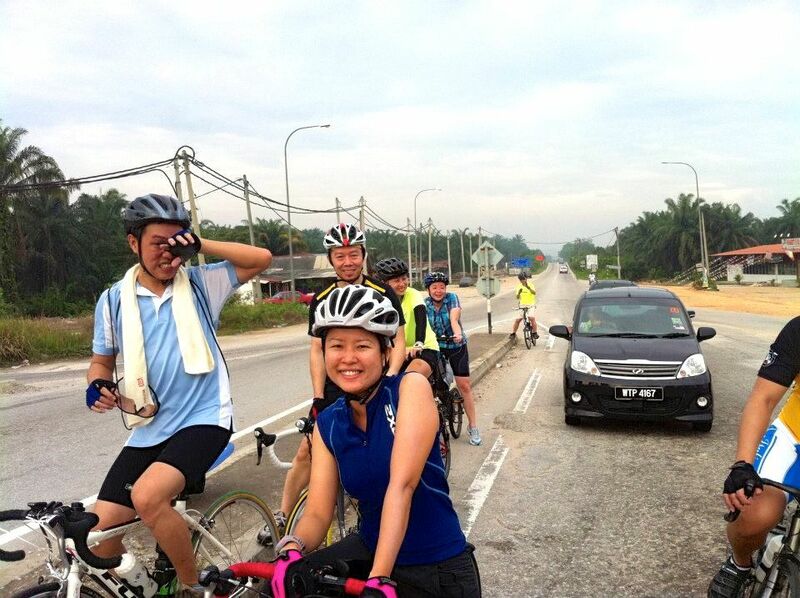 Everyone was relieved that the rest of the way to Kampung Sri Kundang was flat. Hence the smiles at the traffic light at the junction with Jalan Kuala Selangor. It was a warm morning, but there were lots of clouds in the sky. So we weren’t in direct sun. Even so the humidity was high so the ride was sweaty work. We were all glad to get to Kampung Sri Kundang. As always the roti canai and teh tarik was worth the ride. By the time we saddled up again the sun had come out in full force. It was at least 35°C / 95°F during the 33km back down the Guthrie Corridor Expressway. And a tough 33km for those who weren’t used to riding as far or climbing as much as we did today. We were all hot and thirsty by the time we got back to Bukit Jelutong. 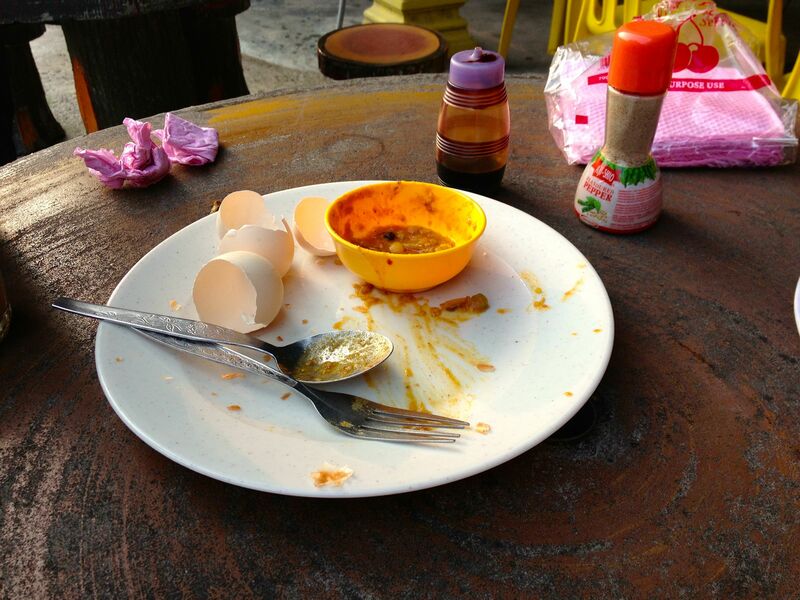 I had emptied both my bottles in addition to the two teh tarik I had with my roti canai. I went straight into the 7-11. Firstly because it is air-conditioned, and secondly to buy a 1.5 liter bottle of 100 Plus. I had never drunk a liter and a half of anything in one go before. There is a first time for everything. 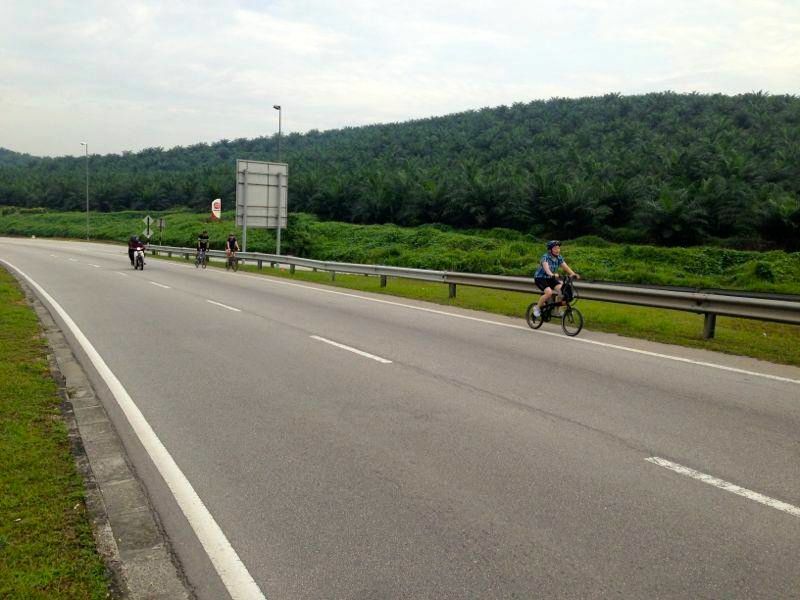 Posted in Cycling in Malaysia and tagged Bukit Jelutong, Guthrie Corridor Expressway, Hot, Kampung Sri Kundang, Roti canai, Teh Tarik, Van's Urban Bicycle Co. Bookmark the permalink. My alarm went off this morning at 4.15am. 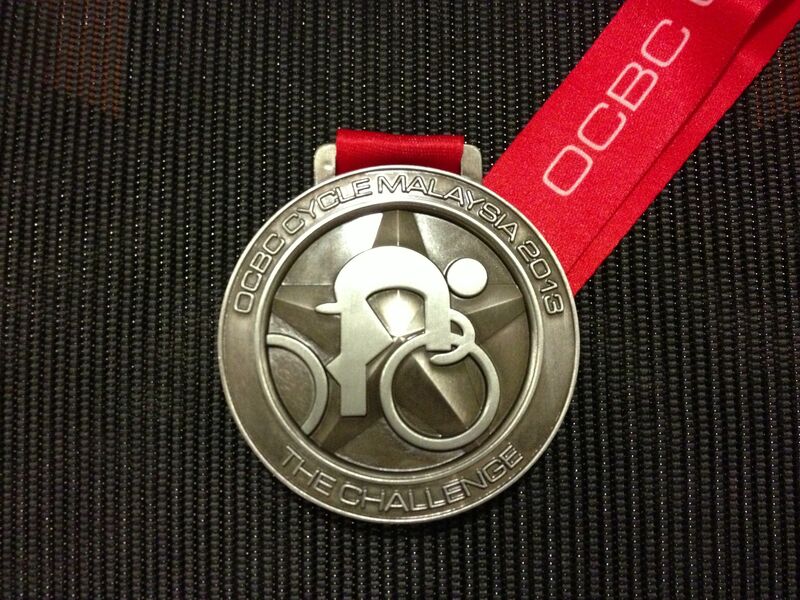 It was time to get ready for the OCBC Cycle Malaysia ride. 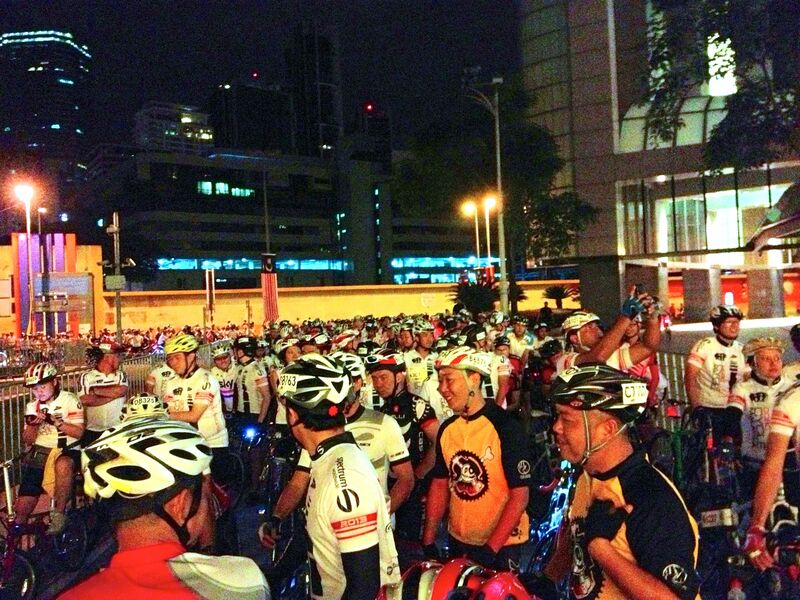 Malaysia’s only mass participation cycling event on closed, public roads in Kuala Lumpur. Our start time was 6.15am. That would give us time to complete four loops before the city streets were once again opened to motorcycles, cars, lorries and buses at 8.30am. By 5.00am my Racun Cycling Gang buddies were arriving at the entrance to my apartment building. The ride started in front of the Petronas Twin Towers. The building I live in is 500 meters from the Twin Towers. So I had access to some of the most coveted parking space in the KLCC area. 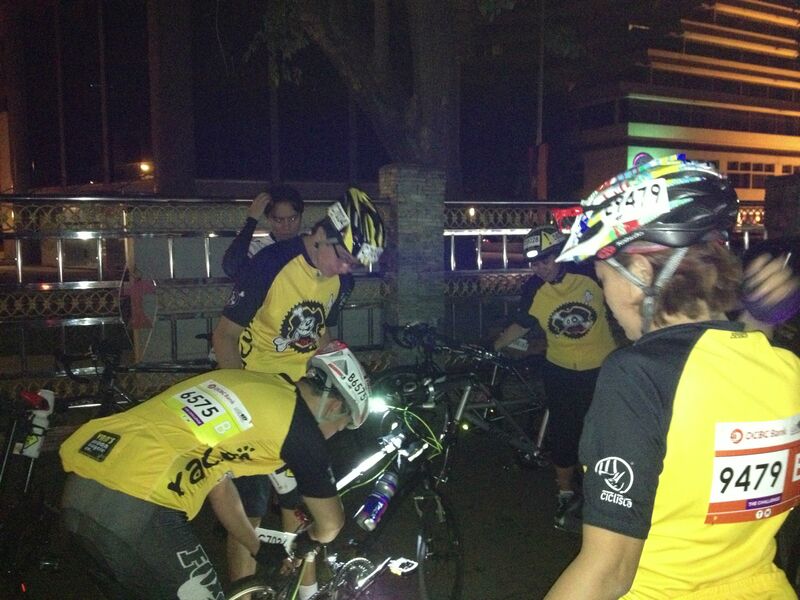 At 5.30am we were gathered in front of Restoran Pelita, about two-thirds of the way to the start. 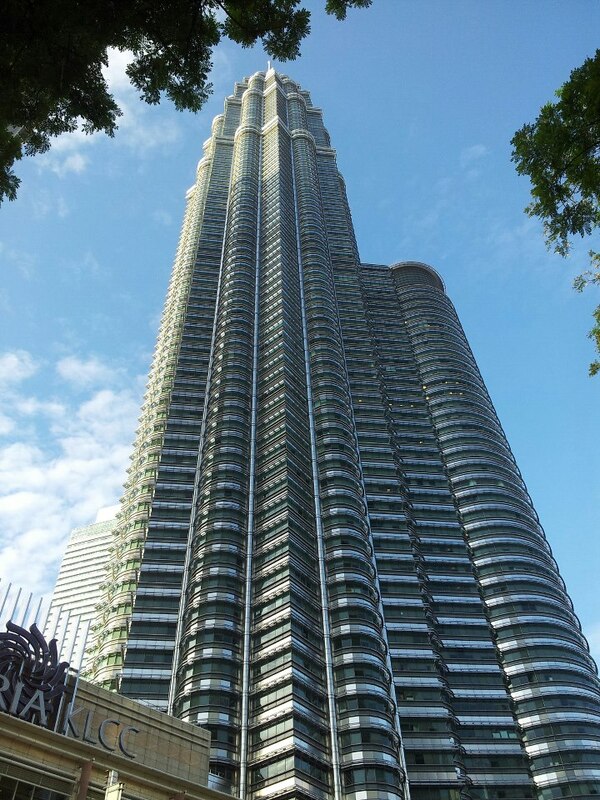 That was where we met those of our group who had parked further away and had ridden to the KLCC. Time for some last-minute adjustments before we rolled to the start. This ride was billed as one of the largest of its kind in Malaysia. It certainly seemed that way as we waited amongst about 5,000 other riders at the start. There were riders from Singapore, Thailand, Indonesia, the Philippines and from further afield. Being amongst so many riders was a bike-spotter’s dream. The “splash the cash” award went to the rider on the bike right beside us at the start. I had never seen a Specialized S-Works McLaren Venge in the wild before. The only difference between the bike in the photo above and the one we saw this morning was that the Zipp 404s had been swapped out for a Mad Fiber carbon wheelset. So it was with the heady sight of a RM 54,000 / US 18,000 bicycle disappearing into the darkness ahead of me that I started the ride. I soon forgot all about the Venge as what was supposed to be a fun ride exploded around me. For some reason the organisers had given each of us a timing chip. Perhaps that was the reason for so many people blasting along the fairly narrow start chute at maximum speed. Sadly a number of riders came to grief a few minutes later along Jalan Raja Chulan when they hit a pot hole at speed in the pre-dawn darkness. From the pieces scattered along the edge of the road I think at least two riders are in the market for new carbon front wheels. A few others required medical attention after going down hard. Mark L picked up a double puncture along the same stretch of road. Fortunately we had a spare inner tube each so he was able to fix both flats. The upside, if you could call it that, of having a double puncture is that by the time we got rolling again the sun was up, and the high-speed riders were all ahead of us. The rest of the ride was a lot of fun. A few meandering cyclists notwithstanding. After the drama of the flat tires there was a short climb into the Lake Gardens followed by a u-turn back down the hill. We rode past the Bank Negara Malaysia (Central Banks of Malaysia) building and through a wooded and quieter part of the city. The second half of the loop took us back past the office blocks, shop houses, hotels and apartments of the city center. It was a treat to ride on streets that are usually clogged with traffic. Photo courtesy of Yuri Wong. When I was sixteen I cycled to school along some of these same streets. So I really appreciated the opportunity to ride through a city center that has changed dramatically since then. The morning ended in the best way possible. I made it safely to the finish in front of the Twin Towers, where I got my participant medal. Then it was back to Restoran Pelita with the Racun gang, where we traded ride stories between mouthfuls of roti canai, nasi lemak and teh tarik. Posted in Cycling in Malaysia and tagged KLCC, Kuala Lumpur, Mad Fiber, McLaren Venge, Nasi Lemak, OCBC Cycle Malaysia, Pelita, Petronas Twin Towers, Racun Cycling Gang, Roti canai, Teh Tarik, Zipp. Bookmark the permalink. My plan for a morning ride on New Year’s day suffered a serious blow as I sat in a traffic jam at 2am. The injury proved fatal to my plan. The official time of death was 5.45am. Which was the time when I turned off my alarm, rolled over and went back to sleep. So my first ride of 2013 was on 2nd January. There were about twenty of us who set off from Van’s Urban Bicycle Co for an evening ride around Kelana Jaya. Most people were riding what Van’s specialises in – folding bicycles. I had not ridden this route before I so was very happy to stay at the back of the group and take in the sights. As you can see from the route this was an urban ride in every respect. Van’s occupies shop space in 3 Two Square, which sits in a group of commercial buildings on the edge of a large residential area. We alternated between busy main thoroughfares and quieter neighbourhood streets. We rode past restaurants, schools, banks, mosques, sports facilities, a park and of course lots of homes. Naturally we had to stop for refreshments at a mamak restaurant a kilometer or so before we got back to Van’s. We parked our bikes in front of the closed pharmacy next to Al-Ehsan restaurant. As is often the case in the evenings folding tables are set up on the sidewalks, and where possible, on the edge of streets as well. We joined some tables together and plonked ourselves down on plastic stools. We tucked into what else but roti canai, nasi lemak and teh tarik. We didn’t cover many kilometers, but that isn’t the point of the Racun Cycling Gang rides. There will be time enough for kilometers and climbs this weekend. This was a good start to the year. Posted in Cycling in Malaysia and tagged Folding Bicycles, Kelana Jaya, Nasi Lemak, Roti canai, Teh Tarik, Van's Urban Bicycle Co. Bookmark the permalink. It is time for a breakfast taco, or some apple pie, or a roti canai, or just a breather. You come to a stop and immediately look around for a way to keep your bike upright. If you happen to be at the beach in Hoek van Holland in the Netherlands you could park your bike in one of these racks. And not have to worry about one of your most cherished possessions toppling over and getting scratched, or worse. In the absence of a rack you have to make do with a pole or a fence or a curb to lean your bike against. Usually somewhat nervously because the risk of a gust of wind pushing your bike over is ever present. If you are in the midst of an organized ride you can bet your house that all available poles, fence space and curbs are already occupied when you pull into a rest area. So you can resort to the double bike ‘interlock and lean’ technique as demonstrated below. This is a relatively secure way of parking two bikes, but it does require careful adjustment if the ground is sloping. Watching your bike roll into a heap on the ground is entertaining for everyone but you. The alternative, if you are on grass, is to just lay your bike on the ground. Drive side up of course! If you are lucky the ride organizers will have provided bike racks. This one is just a horizontal length of pipe that you hook your saddle or handlebar onto. Simple and secure. The Not Possibles have a convenient place outside the Coffee Club to park their bikes. It was Christmas Eve by the way. Spots like this where a dozen or more bikes can be parked are hard to find, especially outside cafes and restaurants. Even more so outside the roti canai and nasi lemak stalls where I have been lately. Nothing that a bit of creativity won’t solve though. 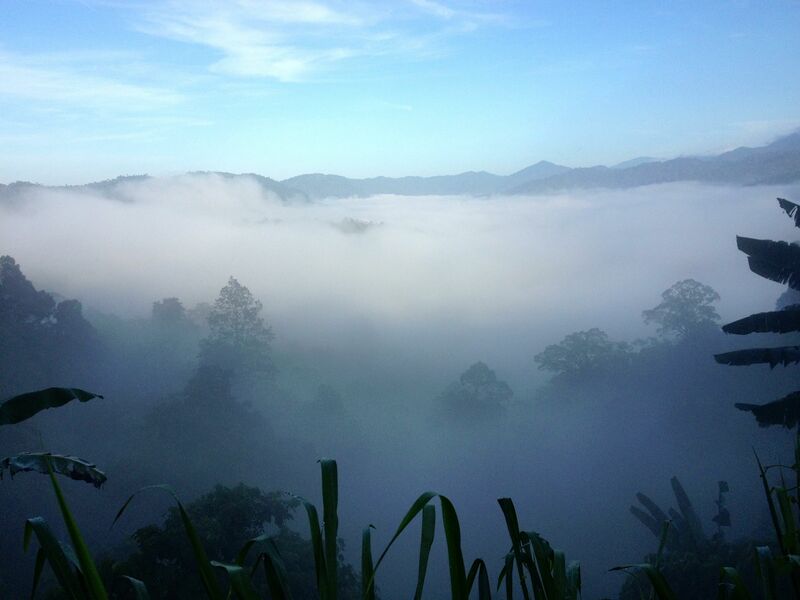 This was the scene across the road from the roti canai stall in Kundang this morning. Where to park? Just ditch it! 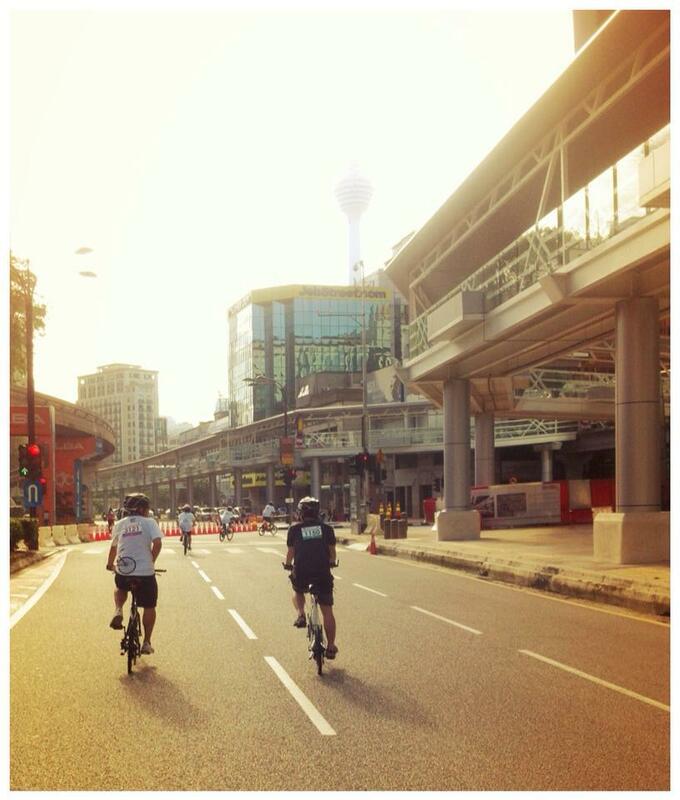 Posted in Cycling in Malaysia and tagged Parking, Roti canai, The Coffee Club, The Netherlands, The Not Possibles. Bookmark the permalink.